The normal cycle of hair growth lasts for 2 to 6 years. Hair growth occurs in 3 cycles. About 90 percent of the hair on your scalp is growing at any one time. This growth phase usually lasts for about 2-6 years (anagen). Each hair grows approximately 1 centimeter (less than half an inch) per month during this phase. It is then followed by the transitional phase (catagen) that takes 1-3 weeks. About 10 percent of the hair on your scalp, at any one time, is in a resting phase for 3 months (telogen). After 2 to 3 months, the resting hair falls out and new hair starts to grow in its place. It is normal to shed some hair each day as part of this cycle. However, some people may experience excessive (more than normal) hair loss. Hair loss of this type can affect men, women and children. Alopecia or loss of hair is a common complaint in men and women alike. Alopecia is divided into scarring and nonscarring alopecia.,depending on how much permanent damage has been caused. Alopecia can be diffuse or patchy depending on the areas of involvement. Most common cause of diffuse alopecia is telogen effluvium, which is the loss of telogen hair that occurs 2-4 months after an acute systemic stressful episode For example, about 3 or 4 months after an illness or a major surgery,or pregnancy, you may suddenly lose a large amount of hair. This hair loss is usually self limiting. Hormonal problems may cause hair loss. If your thyroid gland is overactive or under active, your hair may shed. Treating the thyroid disease can help this hair loss. Hair loss may occur if male or female hormones, known as androgens and estrogens, are out of balance. Many women notice hair loss about 3 months after delivery. During pregnancy, high levels of estrogens cause the hair follicles to retain hair that would normally fall out. When the hormones return to normal these hair follicles shed hair all together which is perceived as hair loss. After 3-4 months of shedding the normal cycle of growth is restored. Medicines that can cause hair loss include blood thinners (also called anticoagulants), medicines used for gout, medicines used for chemotherapy to treat cancer, vitamin A (if too much is taken), birth control pills and antidepressants. Certain infections can cause hair loss. Fungal infections of the scalp can cause hair loss in children. The infection is easily treated with antifungal medication. Finally, hair loss may occur as part of an underlying disease, such as lupus or diabetes. Since hair loss may be an early sign of a disease, it is important to find the cause so that it can be treated. Yes, breakage of hair can occur due to excessive handling of the hair with hair styling devices and can lead to dry and brittle hair that then breaks easily. If you wear pigtails or cornrows or use tight hair rollers, the pull on your hair can cause a type of hair loss called traction alopecia. If the pulling is stopped before scarring of the scalp develops, your hair will grow back normally. However, scarring can cause permanent hair loss. Hot oil hair treatments or chemicals used in permanent hair treatments (also called "perms") may cause inflammation of the hair follicle, which can result in scarring and hair loss. What is the role of diet in hair loss? Diets low in essential nutrients like iron, folic acid, biotin, vitamin B12, vitamin D3, calcium etc can be a cause of hair loss. These nutrients play a role in the hair growth cycle so their deficiencies can cause clinical hair loss. Vegetarian diets usually have low amounts of these nutrients. grade VII- enlargement of both bald areas being separated by only a band of sparse hair. Women may develop female-pattern baldness. Most common in females aged 20-40 years. Three types of female patterns of hair loss have been described have been described. Is there any treatment for androgenetic alopecia? Depending on your type of hair loss, treatments are available. For men mild to moderate hair loss particularly involving the frontal area topical minoxidil 5%- 10% can be used. For prominent frontal recession oral finasteride (1mg per day) is presently the drug of choice, For men with severe grades of alopecia surgical options like single follicle implantation, scalp reduction, rotation flaps, punch grafting etc are available. For women minoxidil 2% lotion and oral finasteride (2.5- 5mg per day) are available depending on the severity of hair loss. 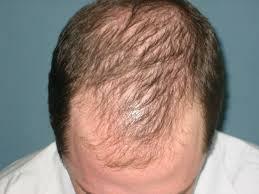 Alopecia areata is the name for a condition in which round patches of hair loss appear suddenly. The hair follicle is attacked by the patient's own immune cells for unknown reasons. There are three stages: first, there is sudden hair loss, then the patches of hair loss enlarge, and last, new hair grows back. This process takes months, sometimes more than a year, but rarely does the hair never grow back. Yes, it is treatable. Both topical and systemic medications as well as injections can be prescribed. Localized steroid injections can be given into the patch to speedup hair growth. Potent topical steroids with or without minoxidil (2% lotion) can also be given. Extensive alopecia areata can be controlled on oral steroids in pulse form or daily doses. Cases with generalized involvement, with history of atopy, involvement along the scalp margins, nail involvement and other autoimmune diseases are resistant to treatment and response maybe slow. Does hair regrowth occur in all types of patchy alopecia? In one form of patchy alopecia, cicatricial alopecia, scarring is characteristic. Here hair follicles have been destroyed so hair cannot regrow. Causes for this type of alopecia include diseases like discoid lupus, lichen planus, morphoea with involvement of the scalp. Any form of medical treatment is ineffective except in very early cases where immunomodulators may help control the disease.